Paul McGinley has a business idea that will make those hefty airline charges for golf clubs a thing of the past if it eventually takes off. The Dubliner has teamed up with former college pal Tony Judge to provide holiday golfers with a club rental option at five major airports - Malaga, Faro, Dublin, Edinburgh and Glasgow. Low-cost airlines such as Ryanair or Aer Lingus charge passengers €30 each way to travel with their golf clubs. But enterprising McGinley plans to rent out top of the range clubs provided by TaylorMade, Ping or Titleist for just €35 per week. Explaining the idea, McGinley said: “You’ve been down in Portugal with friends. You get your Aer Lingus flight down and then you go online and order your golf clubs for the week. You’ve got a choice of Taylor Made, Ping Titleist, all top of the range and up to the minute. “You order a set of whatever you want, pick them up in the arrivals hall at the airport and you pay €35 for the week. “Nowadays the airlines are charging €30 down and €30 back and we are going to charge €35 for a set of rental clubs for the week. There’ll be an office in the airport like those for the hire cars – you hand in your credit card and your booking number and get the clubs you want. They’ll be in a package which will have your name on it. It’ll just be a case of ‘there you go’. “You return them the following week and if you don’t, we’ve got your credit card and will nail you like a hire car company does. It’s a cross between rent-a-car and renting skis. Cost is not the only inconvenience connected with flying with golf clubs. The sheer physical effort required is another turn off. “Take somebody like my mom,” McGinley explained. “She’s got her clubs and is going down to Portugal for two weeks holidays. She has to pay €30 down and €30 back but it’s not so much the price, it’s having to lug your clubs around the airport. “You’ll get top of the range clubs for €35 for the week. Any clubs you want, left or right-handed, ladies and men’s. It’s very simple and the airlines are happy too because now they don’t have to carry the clubs or deal with passengers when they get lost or things like that. “The idea is to grow it globally then and we are already in discussion with Orlando airport and we’ll have exclusive deals with these airports for five years. “It’ll be like rent-a-car – you come in and Hertz are right there. If you want to go with another, less expensive firm, you’ve got to get in a bus and go five miles down the road. So you think, okay, I’ll pay them the €10 extra and do it here. 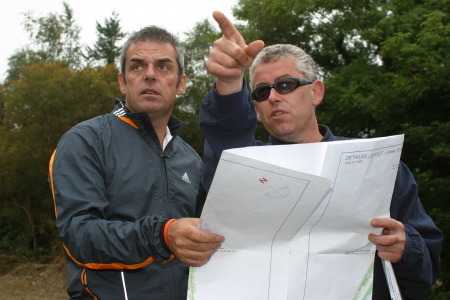 Paul McGinley’s club hire business is all set for take off. Golfers who are fed up paying airlines hefty each way charges to take their clubs on holiday can now hire top of the range equipment at www.clubstohire.com for just €35. Finally some good news for Ireland-bound golfers who are fed up paying airlines a fortune to transport their clubs. 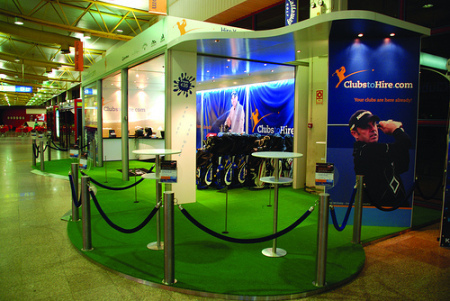 Ryder Cup hero Paul McGinley has announced that the latest ClubstoHire.com store will open at Dublin airport on April 1.